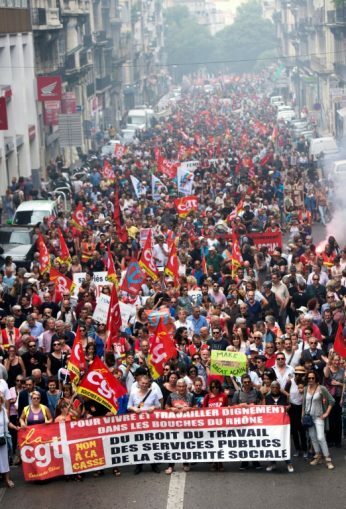 A march by some divisions of the General Confederation of Labor (CGT) in Marseille, France, May 26. Paris, France, May 27 — In numerous corners of France, workers and students’ struggles continue as May draws to an end. This prolonged duration has hardened the lines of conflict. The fundamental challenge to neoliberal policies implemented by President Emmanuel Macron’s government over a year ago has not wavered. This is true, even though it is hard for many striking families to see their reduced pay slips or to find enough strength to attend the many demonstrations called by general assemblies and trade unions. In the transport sector — at SNCF (the French abbreviation for its railroad system) and sporadically at Air France — strikes have continued for two months on a regular basis. The strike pattern is two days on strike, three days at work. At the SNCF on May 23, the coalition of striking unions announced that 95 percent of the railroad workers consulted were against the neoliberal “reform” of the rail transport sector that the government intends to impose. At countless rallies held periodically in the country’s major cities, civil servants joined contingents of militant railway workers, who were at the forefront of protest movements, and enlarged the common struggle. In early May, Air France’s CEO was forced to resign following the results of an internal referendum that rejected his salary increase proposals, which the workers considered inadequate. Workers in the energy sectors have been at the heart of the struggle since the very beginning — since December 2017, even before the beginning of the railway strike. On Dec. 7 workers in the electricity and gas industries went on strike to weigh in during wage negotiations. A policy of austerity had imposed a freeze on basic national wages in 2017. The electricians and gas workers have long experience in the struggle. The energy sector has been largely privatized in recent years, under pressure from European Union policies of privatization, and opened up to competition. Recent French governments have gone along with the EU’s demands. 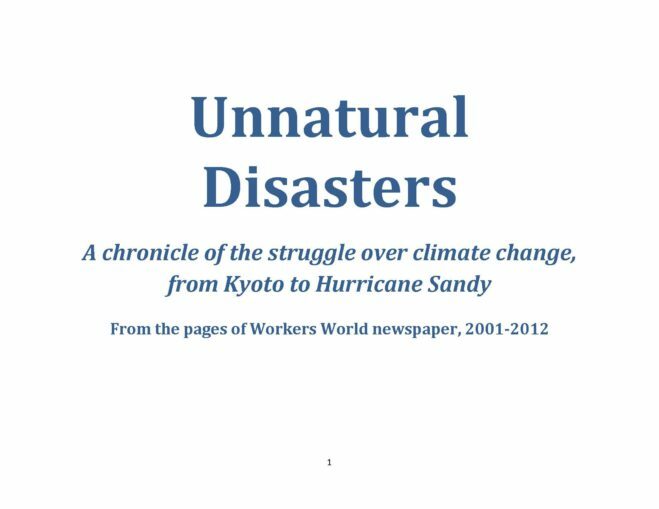 Imposition of these destructive strategies, aimed at dismantling public energy service — which has an excellent reputation in France — has increased the risk of supply disruptions and caused recurrent restrictions and outages. It has also allowed for different prices to be charged to users in different regions. There have been frequent increases in energy prices borne by individual households. These policies have inflated the profits of private producers that have entered the market to capture the most profitable niches. More often than not, the multiplication of privatized and competing local gas and electricity suppliers is irrational. With so many private operators, there is no mechanism for setting environmental targets in relation to climate commitments for reducing carbon emissions. Striking electric and gas workers decided to carry out creative approaches to struggle – “Robin Hood” shock operations. They involve cutting power to large companies that lay off employees while making huge profits for shareholders. Another tactic is, conversely, to restore electricity and gas to families in financial difficulty who are unable to pay their energy bills. Often entire working-class districts, or even parts of regions identified as disadvantaged, see their bills reduced thanks to these “Robin Hood” operations. Sometimes, these actions are carried out during demonstrations: Comrades hide their faces, then form a huddle called a “turtle,” somewhat resembling a rugby scrum. They huddle above a manhole cover leading to underground lines. One worker, chosen beforehand and unknown even to fellow workers, goes down the opening to carry out the mission. The demand for renationalization of the energy sector is a priority. “Yes to the public production of electricity and gas!” is one of the workers’ slogans. Energy security and equality for all are the objectives, along with energy independence and a guarantee of meeting the environmental objectives and ecological targets for reducing greenhouse gas emissions. Energy, essential to all aspects of life, is not a commodity but a common good. And as a common good, resulting from an enormous national investment of equipment created by French workers, it must belong to all. The struggle for public electricity and gas service is today one of the key dimensions of French workers’ struggles. Herrera is a Marxist economist, a researcher at the Centre National Recherche Scientifique, who works at the Centre d’Économie de la Sorbonne, Paris. WW staff translated.